PGT room enclosures can add more space to your home! 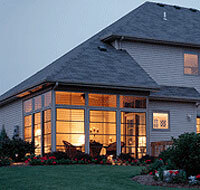 PGT® Eze-Breeze® offers more space, more comfort and more year-round livability. It’s almost like adding another room to your home. With Eze-Breeze Sliding Panels, you can really start to enjoy your outdoor space, often the least-used areas of your home: your porch, your outdoor deck, pool, gazebo or garage. Whether you’re replacing an existing screen enclosure or adding it for the first time, you can turn those neglected spaces into year-round gathering places. PGT® Eze-Breeze® gives you two ways to enclose your outdoor spaces. Vertical Four-Tracks open up to 75% of your window area for ventilation, while Side Sliders open half way. 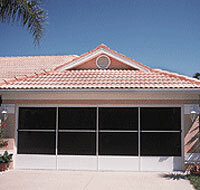 PGT® Eze-Breeze® Garage Door Screens are an affordable way to get more use out of your garage.